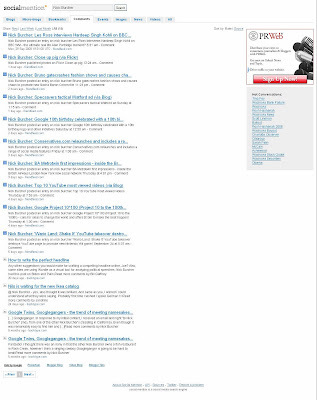 MSE360, 123people.com, Social Mention and new Google Blog Search - more Social Search developments! Based in London and in 'extreme alpha', MSE 360 uses a combination of APIs and a custom crawler called 'Fred' to pull results from the web, Wikipedia, blogs and images all into one page. The nicely laid out results are also influenced by community opinion with a '+' or '-' sign allowing users to push results up or down the rankings, though no personal / user information is stored on the MSE360 servers. "Adapting some of the technology pioneered by Google News, Google are now showing categories on the left side of the Google Blog Search page and organising the blog posts within those categories into clusters, which are groupings of posts about the same story or event. Grouping posts into clusters lets users see the best posts on a story or get a variety of perspectives. When users search within a cluster, they find a collection of the most interesting and recent posts on the topic, along with a timeline graph that shows how the story is gaining momentum in the blogosphere." (more at Official Google Blog). 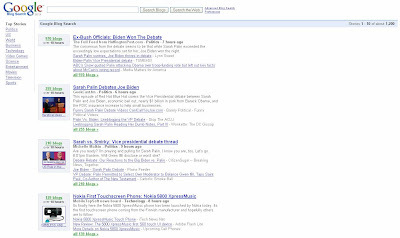 In this example, the green "255 blogs" link takes users inside the cluster and shows all the blog posts for the Sarah Palin / Joe Biden VP debate. Based in Ottawa and built on the Yahoo! BOSS platform, Social Mention is a new social search engine that allows users to either search within particular channels (just blogs or just micro-blogs or just images etc) or produce a single page of aggregated social media results (more on Mashable). 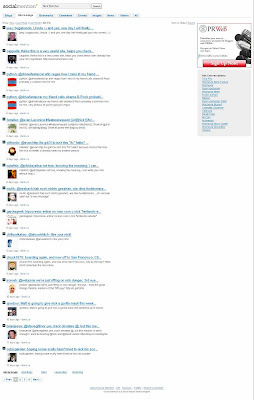 I think the ability to search in just blogs or comments etc is great, though I had mixed results when I tested it. 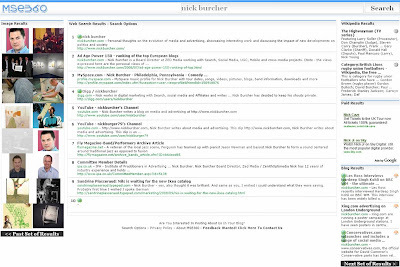 Results for 'Nick Burcher' were good in the blog search, image search and comment search (though I think Friendfeed results should be moved out of the 'comments' area - maybe into microblogging?) The relevance of the results in the microblogging and video sections were not as good though, with most of the returns not relevant to the query. 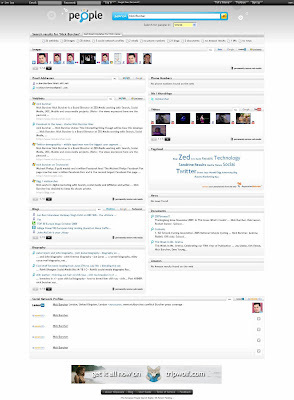 123people.com has a public launch on 16th October 2008, but is operational in Beta now. 123people.com aims to bring results from many sources into one page and combines virtual and real world identities in one place - including details of social network profiles, email addresses and phone numbers! 123people.com also creates tag clouds, collates new results and is available in English, German, Spanish and French. All of the above show how quickly search is evolving and how social media information and content is helping search engines become more relevant and more useful. I think combining offline and online information in searches is a particularly notable development - though slightly creepy at the same time. Universal search has been developing (with image results and video results amongst the text based returns) but the above indicate that Universal Search is harnessing social media footprints to move to a whole new level - and it's moving there quickly! I love the fact that while Social Mention is searching it comes up with "Generating 1.21 Gigawatts". Nice touch! In 130 countries around the world, each piece of Omega was sold by first-class dealers is the young generation's ideal Omega Watches in modern times.as well as pursue the Omega Watches sale . In American, cheap Omega Watches is the most popular and dicount Omega Watches and the best Omega replica Watches. The combination of Omega Watch and the Omega Watch sale make Fake cheap Omega Watch the leader in the watchesindustry. dicount Omega Watch in moden times is very popular and Omega replica Watch must give you a new life!